In the matchup that everybody will be talking about on Friday, Blake Griffin gets the perfect show out spot against his former teammates in the Motor City. I was expecting his price to skyrocket in anticipation, but it didn’t, rising just $100 on both sites. He’s shot the ball 19, 20, and 19 times in his last three games, and I wouldn’t be shocked to see his usage rate close to 40% when he tries to stunt on Steve Ballmer and the Clippers. Will Barbaric Blake be unleashed? Or will we get… Emotional Blake. Lou Williams just got paid bags and yet, his price dropped to a juicy $6.8K on Fanduel. Both Austin Rivers and Milos Teodosic are questionable, and if either sits, Sweet Lou gets an even bigger bump. Philly has been playing at a slower pace and turning the ball over a lot less as of late, and as a result, they’re not the most fantasy friendly matchup anymore. Regardless, I still like Jrue Holiday at his $7.6K tag who, if Rajon Rondo comes off the bench, becomes the de facto point guard for the Pellys. and finally, the infamous eye lash injury. Assuming none of the newcomers suit up for The Land, the only D-Day survivors who have seen meaningful minutes this season are: J.R. Smith, Jeff Green, Kyle Korver, Tristan Thompson, Cedi Osman, Ante Zizic, Jose Calderon, and of course, LeBron James. They may be forced to supplement this crew with a G-Leaguer or two. In the past two weeks, Bron has played 91 of his 266 minutes without Isaiah Thomas on the court and sees his fantasy points per minute increase from 1.43 to 1.54. Point LeBron’s per 36 averages during that period are 22/11/12, and with a shorthanded squad his upside is immense. Easy triple double, easiest play of the day. I’m all in on Cedi Friday night – and apparently so is Coach Ty Lue. Lue told the media after the last game: “I've got to keep playing him. I mean, he brings a lot. He can guard 1s, 2s and 3s ... he's in the right spot defensively all the time … offensively he can make plays … and we have to find minutes for him” (espn.com). Green is probably my 3rd favorite Cavalier, and depending on how the rest of the slate shakes out, I’ll may also play J.R., Korver or Tristan. Zizic could see enough minutes to be worth a roll of the dice in tourneys, but I’m still saying no way Jose (Calderon). This, of course, this could all change if any of the reinforcements end up playing in Hotlanta. On the ATL side, Dennis Schroder and Kent Bazemore just seem a little too overpriced for my taste. Taurean The Fresh Prince is under $5K on both sites and poised for a huge performance against Clevelan (no D). Ricky Rubio has really turned his season around and is still not a bad play, even at $8K on FD. He’s more appealing at his $7.1K tag on DK, especially at a PG position that’s relatively weak on Friday. Jamal Murray has had three days to rest his ailing thigh, so he would make sense as a high-risk tournament play. Personally, I don’t play the Blue Arrow on the road where he shoots 14% lower on three-pointers and averages 0.08 less fantasy points per minute than he does at home in the Pepsi Center. Jimmy Butler and Zach LaVine will get their first cracks at their old squads in what should be another fun game between the Bulls and the T-Wolves. 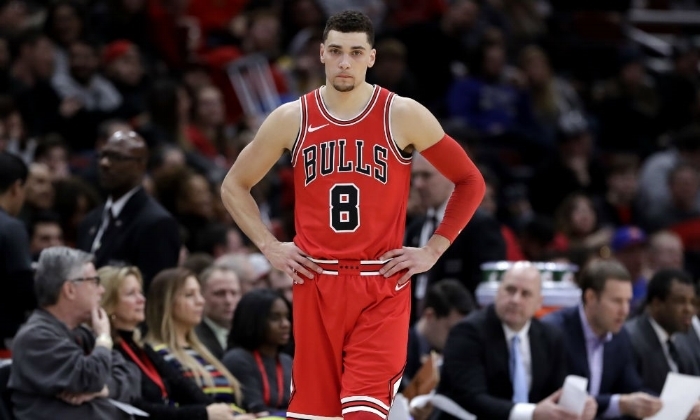 LaVine is scorching over the last two weeks, averaging 1.22 fantasy points per minute: the same as Chris Paul and just 0.06 less than LeBron. Jimmy G. Buckets will look to put on a show for his fans in The Chi, and the Bulls have struggled to defend wings all season long. He’s not as safe of a play as shorthanded LeBron, but he has humongous upside in this spot. It’s usually not a bad strategy to attack the Bulls at the guard positions, so Jeff Teague and Andrew Wiggins can both be in consideration with their prices in the low $6K’s. I don’t particularly love the top-flight point guards in CP3 and Dame Lillard, but with all the value available, I think they both should get you 40 to 50 points and are safe pay-up options. The same goes for James Harden, who has shown a 50-to-55-point floor. As always, there will inevitably be late-breaking injury news on Friday, so pay attention but don’t reach for value. We (should) have enough cheapo options on the Cavs to be able to afford anybody we want on this slate.